As the popular saying goes - A journey to a man's heart is through his stomach.....but I'd like to reword as - A journey to anyone's heart is through the stomach!! There are very few things more pleasurable than good food. After all, we work, slog, struggle and at the end of the day, all of it boils down to have good food! Truly, it lives up to its punch line..By just looking at the man responsible for VahRehVah (Sanjay Thumma) cook, and make delightful gestures on how tasty the food will turn out is enough for you to put your cooking hat (apron) on!! His recipes range from mouth watering Indian dishes to Italian, Chinese and even the very famous Southern Fried chicken..
And the best part of all these cooking videos is that he makes it very simple. You need not have special equipment or difficult-to-find ingredients to cook these dishes. You can manage with what's available around you and pick up most of the ingredients required from your local grocery store. And do the dishes turn up as tasty as Sanjay's gestures….? ?The answer is a BIG YESS!!! All his recipes are very easy to cook and at the end they taste like if they are cooked by Pros!! I feel all you guys, especially all NRI's should check his recipes and try them. Also, all the English folks who feel that the pre-cooked 'n' packed Chicken Tikka Masala from local superstore is great..then just wait till you see the Videos and try it out...You will be amazed by the end result!! The round, hard, puffy puri shell is first broken on top and partially filled with the main stuffing of mashed potatoes or chickpeas. A little haldi powder and/or chilli powder may be added for taste, as well as a pinch of salt. Sweet tamarind chutney and spicy green chutney are poured into the shell on top of the stuffing. Finally, sweetened beaten yoghurt is generously poured over the shell, and the finished product is garnished with sprinklings of crushed sev, moong dal and finely chopped coriander leaves. Indian Food, Indian Food Cooking Recipes, Indian Cuisine Recipes, Indian Recepies, Indian Cooking. ndian foods are very tasty, tempting and spicy. No where else but in India you find such a great variety of dishes being served. Gujarati Thali and Punjabi Dishes are House hold names everywhere in the world. Celebrities all over the world insist on Indian Curry. Even in White House during Diwali , Indian Food recipes are in great demand. Don´t believe? Just try one of these Indian Food recipes mentioned above. Indian food preparation and taste vary with region and climate. From Dum Aloo in Kashmir to Idli Dosas in Tamil Nadu. And Dalbati of Rajasthan is equally mouth watering as Rosso Goollo and Misti Dohi of WB. Not to forget Aloo Chat of Punjab and North India. Learn more of Indian food and its cooking techniques with small tips in each video by your vahchef Sanjay Thumma yes its Indian Food Made Easy. First of all, I'm a great lover of delicious food. I like more of Indian style especially Andhra and Hyderabadi style food. After I have been to US I also started liking Mexican style food. But, I was always thinking, honestly to say dreaming about me cooking and enjoying it. Even I tried once but that has become a big mess. Ever since then I did not get chance to spend more in a kitchen. Initially when I was on shot trips to US, I was bit worried about the food as I had earlier suffered eating Pizzas, salads or frozen food everyday.When I moved to Chicago, I started cooking my self but something like eat to live. Though I was reading many web sites on recipes and cooking instructions, that did not really push me relinquish the my old worries. That one day, when one of my friend suggested the site www.vahrevah.com, I had the same mind set as earlier, but gradually I was developing interest in trying various recipes. But, when I start watching your videos (honestly speaking) I got "inspired" and started developing passion towards cooking. Today, I spend my weekends and holidays cooking and trying various stuff withing my reach. It brought flavour to my life in US. Every now and then, when i chat with my friends, I keep bringing about asking for new receipies. I like your presentation (trust me, it adds up to the reason to be Inspired), your cooking tips for cooking beginners and way content on the site is organized and inviting others to be part of mission at ease. Started with Upmas to Rices and curries to beverages, today I am completely enjoying cooking today. When my mom came to know that I am cooking here and enjoying it she started also inspired and suggesting the best way to cook. She is a great cook when there is a family gathering her Dosakai Sambar with Sweet onions along with a Spicy chicken curry and Chicken pulao are the best. In fact, that will be the motivating factor to form a gathering. I greatly appreciate your passion to cooking and enjoying to the extent what you believe upon. VahreVah.com mission is accomplished. Wish that VahreVah.com will continue on the mission to keep inspiring generations to come. Though, I am not done with my words to express my gratitude, I will limit this here. I wish you all the best in your mission and journey of life. Sauté onions till brown. How brown? I’ve-spent-a-week-in-Goa brown? Or smoke-alarm-shrieking brown? Recipes can be infuriating for amateur cooks. All those annoying professional terms: chiffonade the herbs, add a bouquet garni, julienne the vegetables. How many times have you been bent over a glossy cookbook, double-boiling and basting away like some 21st Century witch, wishing that you could bubble, bubble, broil and etouffe the writer? Fortunately, the YouTube generation has come up with a solution. Between all the videos of apparently unbalanced young men having astonishingly idiotic accidents and stammering adolescents showing us how to use iPhones, there are now heaps of kind chefs and accomplished home cooks who record their recipes, demystifying the kitchen for once and for all. People such as Chef Sanjay Thumma, who has found himself catapulted to stardom thanks to YouTube, are quietly revolutionising the way people cook. 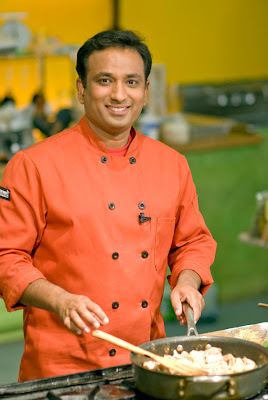 Sanjay began recording and posting his recipes online just two years ago on http://vahrehvah.com. His lemon rice alone prompted 10,000 instant hits. Sanjay says that he now gets an average of one lakh viewers a day from all over the world. Cooking styles have certainly changed. The dog-eared, turmeric stained, well-loved family cookbooks, passed down generations might just become a thing of the past. I, for instance, take my dinky iPod Touch into the kitchen and balance it on the microwave when I cook. The ability to view Sanjay, and cook simultaneously, makes following a recipe as easy as boiling an egg. Sanjay says written recipes are really for professionals. “Home cooks tend to make mistakes,” he says. “With a recipe, one in 10 people can make it good. With a video, 99 out of 100 can make it good.” Especially, with Indian food. As anyone who’s ever tried to learn how to cook from their grandmother knows, Indian food involves a lot of “one pinch of this, a handful of that and a fistful of curry leaves.” Sanjay does precisely the same thing — but you now have the option of pausing, grabbing the mustard/ turmeric/ salt and then mimicking him perfectly. “Indian food is all about adding things at the right time, cooking to the right texture, to get the right results,” Sanjay adds, explaining why it’s beneficial to actually see for how long he fries onions, blends cucumber or churns yoghurt. During the vacation, he bought himself a video camera. 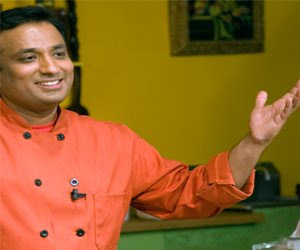 By September 2007, Sanjay had set up a slick studio in Chicago and began recording his first 150 recipes. “I just used the restaurant favourites,” he says, “Because everyone wants to know how to make butter chicken, chicken 65, chicken tikka.” Then came the basic cooking: pakoda, sambar, chutneys. The show is largely based on requests from his large and loyal fan following. The best part? The excited emails from people all over the world. We’ve always known food can break barriers. Teamed with YouTube, it’s clearly unstoppable. Hatsoff to Mr. Sanjay Thumma of Varehvah.com . He inspired many people through his great cooking . Many times i thought that we can not prepare certain dishes in restaurant style at home like chicken tikka , egg puffs , chicken dum biryani , pav bajji , ....etc,. But he made them easy to cook with his great tips . Today morning i thought , why shouldnt i post the dishes i experimented from vahrehvah.com and immediately i started collecting all photos and started posting this . I tried chicken tikka , pav bhajji , double ka meeta , chicken dum biryani , egg puffs , cauliflower milagu curry , kadi pakodi , aloo paratha , indo chinese chilly chicken , veg puff , veg dum biryani , curry leaves rice , jeera rice ,Brinjal tomato curry, capsicum masala rice and tindora chana dal curry. As a blogger when i get compliements like ' i tried ur recipe and turned out good ' , i feel so happy . I always feel that i succeeded something from my blog that gives me immense satisfaction and in same way i thought i should say sanjay with these photos that all ur recipes turned out great and could able to do them with ease. Sanjay these pics are for u . If ever u visit my blog i wish u see ur recipes done by me . Thank u Sanjay .